After Cass Seltzer's book becomes a surprise best seller, he's dubbed "the atheist with a soul" and becomes a celebrity. He wins over the stunning Lucinda Mandelbaum, "the goddess of game theory," and loses himself in a spiritually expansive infatuation. A former girlfriend appears: an anthropologist who invites him to join in her quest for immortality through biochemistry. And he is haunted by reminders of the two people who ignited his passion to understand religion: his mentor and professora renowned literary scholar with a suspicious obsession with messianismand an angelic six-year-old mathematical genius who is heir to the leadership of a Hasidic sect. Each encounter reinforces Cass's theory that the religious impulse spills over into life at large. Using her gifts in fiction and philosophy, Goldstein has produced a true crossover novel, complete with a nail-biting debate ("Resolved: God Exists") and a stand-alone appendix with the thirty-six arguments (and responses) that propelled Seltzer to stardom. The world shifted, catching lots of smart people off guard, churning up issues you had thought had settled forever beneath the earths crust. The more sophisticated you are, the more annotated your mental life, the more taken aback youre likely to feel, seeing what the worlds lurch has brought to light, thrusting up beliefs and desires you had assumed belonged to an earlier stage of human development. What is this stuff, you ask one another, and how can it still be kicking around, given how much we already know? It looks like the kind of relics that archeologists dig up and dust off, speculating about the beliefs that once had animated them, to the best that they can be reconstructed, gone as they are now, those thrashings of proto-rationality and mythico-magical hypothesizing, and nearly forgotten. For a book whose title sounds like an affirmation of faith but whose story is about an atheist refuting the existence of God, reading it is a spiritual experience... Many of the positive reviews laud the wit and entertainment Goldstein provides, but honestly, the breadth and depth of ideas covered require close and thoughtful reading... This novel can be read on a few different levels: a romance, a mystery, an intellectual thriller or a philosophical/religious treatise. In any case, some grounding in science, math and philosophy or at least a willingness to explore those subjects would be helpful. (Reviewed by Judy Krueger). [T]he pleasures to be found in “36 Arguments for the Existence of God” are scattershot. But there are a great many of them, and this novel’s bracing intellectual energy never flags. Though it is finally more a work of showmanship than scholarship, it affirms Ms. Goldstein’s position as a satirist and a seeker of real moral questions at a time when silly ones prevail. Amid the multitude of bestselling books by atheists and apologists preaching to their respective choirs, here finally is an answer to prayer and reason: a brainy, compassionate, divinely witty novel... Goldstein doesn't want to shake your faith or confirm it, but she'll make you a believer in the power of fiction. This is a charming story, deftly told, crackling with intelligence. If I can be granted the license to end with a rabbinic flourish the book itself would frown upon, I would say this work is evidence of the gifted novelist's ability to create world in imitation of the Author of all. [Goldstein's] style is so effervescent and knowing that even if we have only the dimmest grasp of certain concepts, we are carried along. And so 36 Arguments for the Existence of God is also an education in math, philosophy, academia, psychology and Jewish culture. Thoughtful, witty, and – I cannot stress enough – really entertaining, 36 Arguments is part campus comedy, part romantic farce, part philosophical treatise... how many works of fiction can tackle thorny questions such as theodicy and still make you laugh? Not since The Tao of Poohhas philosophy been so much fun. Always smart and intermittently very funny, but the shifts in tone, leaps in chronology and changes of focus can induce whiplash. A psychology professor copes with his celebrity present and haunting past after writing a best seller called The Varieties of Religious Illusion. An award-winning novelist and MacArthur Fellow for her work in philosophy, Goldstein has the wherewithal to discuss a hot topic—where our religious impulses originate and how they shape us. Rebecca Newberger Goldstein does it all. She has written a hilarious novel about people's existential agonies, a page-turner about the intellectual mysteries that obsess them. The characters in 36 Arguments For the Existence of God explore the great moral issues of our day in a novel that is deeply moving and a joy to read. Rebecca Newberger Goldstein received a PhD in Philosophy from Princeton University, has taught philosophy at Bernard College and written five previous philosophically motivated novels. 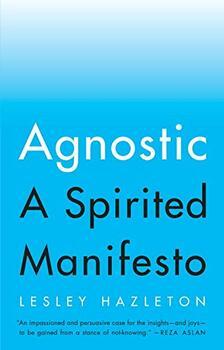 Her most recent book of nonfiction is Betraying Spinoza: The Renegade Jew Who Gave Us Modernity. 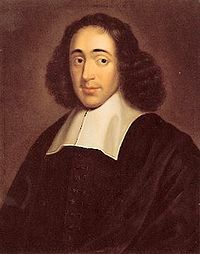 Bertrand Russell considered Spinoza "the noblest and most lovable of the great philosophers."